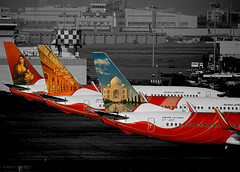 Airliners-India :: View topic - Is there a list of military VU- registrations available? Posted: Thu Jun 22, 2017 6:55 pm Post subject: Is there a list of military VU- registrations available? Does anyone know if there is a list of the military VU- registrations available anywhere? All the Indian Air Force planes seem to also have a VU- registration allocated in addition to their military serial. I have managed to identify some already from observations but it is far from complete.